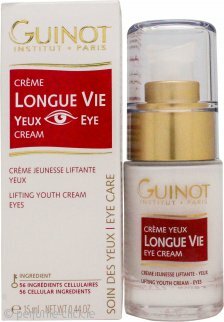 Eye cream lift my eye and it reduce dark circles and puffiness. I am 39 years. And I use that cream already third year. I am happy in purchasing of that cream. So I strongly recommend for all women after 35 years. Lovely to apply, great scent but not over-powering. Make up goes on smoothly and seems effective in smoothing out lines. Delighted with my purchase. The product itself is excellent. I can feel the difference in appearance already.